May all your wishes come true, or at least just this one. 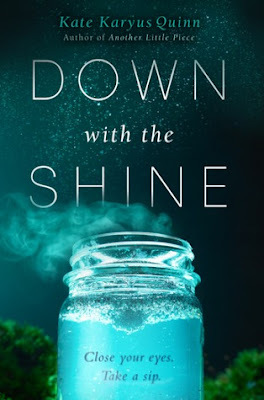 Part darkly humorous cautionary tale, part twisty supernatural thriller, Down With The Shine takes the reader on a roller-coaster ride filled with chopped-off fingers, magical moonshine, Cheetos, ballsy moves (pun intended) and completely unpredictable plot turns. I had tons of fun reading this book and absolutely loved how Kate decided to end the story. As far as magical realism goes, this was, hands down, one of the most intriguing and entertaining stories I've had the pleasure of reading in my entire blogging "carrier". In an act of rebellion and trying to finally "live her life to the fullest", Lennie sneaks out of her home to attend the most popular "IT" party of the year. In hopes of being accepted by the crowd, she brings some of her uncles' famous moonshine with her. As the teenagers start drinking and partying, things quickly get out of hand - Lennie decides to do the traditional moonshine toast with everyone, asking people to "make a wish", and then granting each wish with "may all your wishes come true, or at least just this one." Everyone is having the time of their lives, until the morning comes and people wake up to see their wishes actually granted. And considering some of them wished for "balls of steel", "Midas touch but with Cheetos", "being old and wise and irresistible", or even - in Lennie's case - having her dead friend back alive and safe at home, you can only imagine the mayhem that follows. And that's not even the worst of it. Because now, with Lennie accidentally revealing herself as a wish-granting moonshine geenie (which, btw, she had no idea that she was), Lennie's power-crazed murderer of a father is finally able to locate her. And he is coming for her. How can a single book contain so much awesomeness? Honestly, this was such a fantastic, genre-bending mash-up, I was continuously blown-away until the very end. The barrage of absurdity that follows the wish-granting night is just as hilarious as it is kind of terrifying (can you imagine having the Cheetos touch?). I loved the energy flowing from this book, and I also adored its eerie, alluring and completely surreal atmosphere. Between the horror-like moments filled with mild gore (oh you know, chopped off fingers, a stab wound here and there, a few Cheetos-bursts deaths, etc), and the scenes of melting sweetness between Lennie and Smith, I felt like I was on an emotional see-saw. But it wasn't tiring or nauseating, not at all, it was actually very refreshing and gripping, with a nicely executed build-up of sexual tension and swoony kisses skillfully intertwined with jaw-dropping twists and humorous tension-breakers. It was inventive. It was mesmerizing. It was just so much fun to read. I loved the noir humor in this book. Thick and gritty, it was so well-fitting, I don't think the story would be half as awesome without it. I snorted my drink a couple of times - usually whenever W2 would do or say something so incredibly outrageous and hilarious, I just couldn't keep a straight face. At the same time, I also really appreciated the darker and more serious undertones flowing through this book. I thought the plot involving Lennie's family was really well-thought-out and it added a very interesting aspect to the story. I also really loved the ending. It was one of the most flawlessly executed endings I've seen, and I wouldn't have the story end in any other way. Perfectly satisfying and very meaningful. Overall, if you enjoyed Kate's previous books (like Another Little Piece), chances are you will love Down With The Shine even more. They both have this creepy, darkly humorous, twisty, vaguely magical thing going on, so if you're into that kind of stories, you will not be disappointed. Personally, I loved this book and I know many of my friends loved it just as much. So go ahead, take a sip. Make a wish.